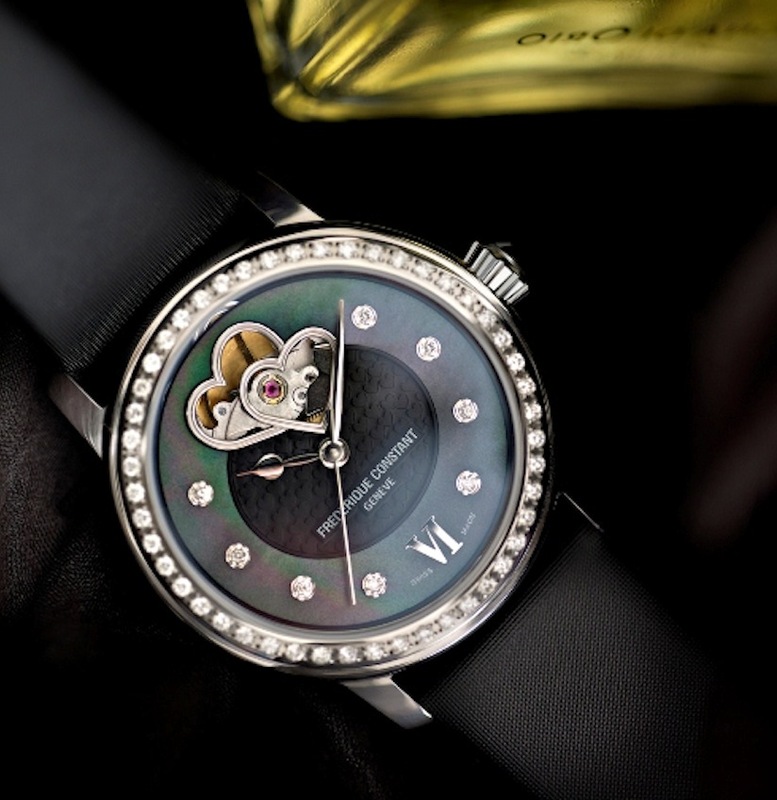 It is no doubt that Frederique Constant Black Beauty is the most exciting addition to Frederique Constant’s bestselling Double Heart Beat Collection. As a watch fanatic, I totally relate to the deep black mother of pearl dial but I know most of my friends will however salivate over the many diamonds of the Black Beauty. The original design of this range, that is two intertwined hearts forming an aperture in the dial revealing the ‘heart beat’ of the movement- makes the Frederique Constant Double Heart Beat more than just a watch. These fine timepieces have been developed with passion to reflect the values and aspirations of today’s woman (like moi). Frederique Constant’s Double Heart Beat watches are created with precision design and assembled by hand, allowing for a high quality timepiece each and every time. When I buy a watch, perceived value is important but the real quality, consistency, craftsmanship ultimately is the main attraction….its just the way this brand thinks. I like the idea of being able to go corporate with my Mont Blanc, wild with my Roberto Cavalli snake watch in mother of pearl or when I feel uninspired, I go for the boring looking white metallic GC that looks like everything else in the market except that its white…big deal! But hey….there is no accounting for taste and sometimes one just isn’t in the mood. However, moods can be changed if there are ultra special pieces that totally give you that extra bit of endorphin kick, making you smile and I believe that the pieces from Frederique Constant have that edge. As always I like brands that are passionate about charity….. What is nice is that US$50 from each watch sold in the Double Heart Beat Collection is donated to charities related to the heart and children. Hence the slogan for this collection is “Assembled by hand to touch your heart”. For people who don’t know watches or don’t know the Frederique Constant brand, the first thing to learn is that they really are on the top position amongst leading makers of Swiss luxury watches. In 1994, Frederique Constant developed its first Heart Beat watch to show the mechanical nature of these Frederique Constant watches. Heart Beat watches have an aperture at the position of the balance wheel to show that the movement of the watch is mechanical. Early in the 1990’s, automatic mechanical watches were slowly making their return to the market after the quartz crisis of the 1970-1980’s. Typically, the exterior of such mechanical watches looks similar to quartz watches except that the second hand moves continuously. On quartz watches, the second hand makes 60 steps per minute. It’s an interesting lesson on how it all works and I am so glad that Frederique Constant considered it important to show the difference between mechanical and quartz watches….it helps uninitiated people like us learn a bit about the back-end of how these beautiful pieces work. In a mechanical watch, the balance wheel beats 28’800 times per hour. The balance wheel rotates clockwise and counter-clockwise on its axes in a large ruby jewel. Its rotation is controlled by the hairspring, which constantly coils and uncoils, and can be seen through the open eye of the Heart Beat watches…i can never do justice in explaining how this works and how awesome these watches are. I suggest you check Frederique Constant pieces out yourselves!